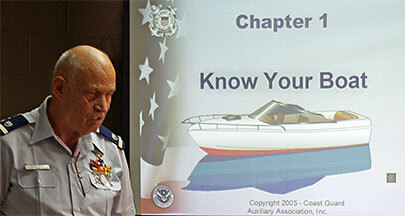 Seventeen boating enthusiasts and three USCG AUX instructors survived the all-day rigors of a boating safety class held on Saturday, May 30 at the FOR Community Center. If you are born after September 1, 1993 you must have this card to operate motorized water crafts over 15 HP or wind-blown vessels over 14 ftâ€‹. <<Texas Park & Wildlife Instructor Paul Day started the class with a slide show. 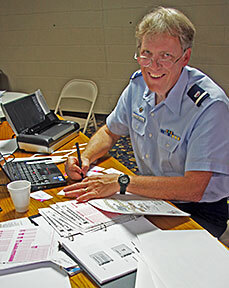 Robert Rice, USCG AUX Public Education Officer, scores the tests. 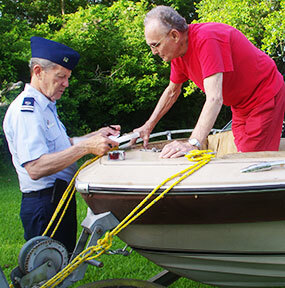 Fred Steves, USCG Aux finishes a no-cost, no-fault safety inspection of Gene Lowe’s boat. 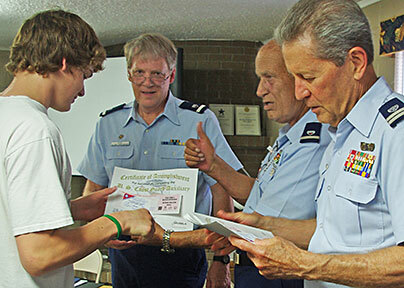 All the students passed the multiple choice, forty question test at the end of the class and received a US Coast Guard Auxiliary Certificate of Accomplishment for successfully completing the course. 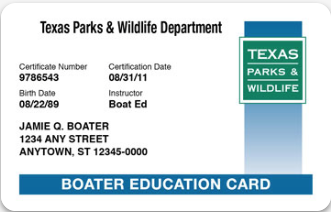 This entitles them to receive the Texas Boater Education Certificate (pictured above) from Texas Parks & Wildlife.